The mine lies like a scar across a bloody face. Guava village sits in a remote area in Bougainville, Papua New Guinea (PNG), above a copper mine which closed 25 years ago. Resistance to the Rio Tinto-owned pit exploded in the late 1980s and during a recent visit, I got to stand above the massive hole that caused the crisis. Human rights abuses were rampant back then, with locals missing out on the financial spoils. Opposition to the enterprise was inevitable and necessary. 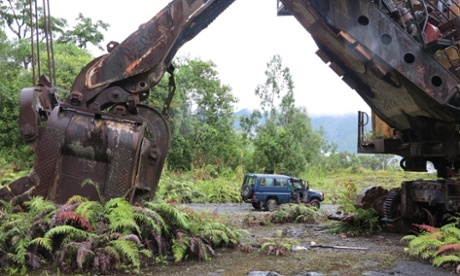 Run by Bougainville Copper Limited (BCL) from the 1970s, the Panguna mine spewed unprecedented amounts of pollution into the ground, water and atmosphere. It lingers to this day but nature has begun to reclaim its rightful place across kilometres of land, dipping its ferns, grass and lush green trees across oily and rusting equipment. Guava, with its 400 inhabitants, is a peaceful place up a steep rocky incline. During the rainy reason, clouds dance around unpredictably and the hot sun shines on the moist and muddy soil. From there, the view above Panguna is breath-taking, the scope of the environmental damage visible, and the lack of clean-up criminally negligent. The Bougainville civil war, which was sparked by conflicts over the mine, lasted 10 years and cost the lives of up to 15,000 people. The PNG government blockade, comparable to that imposed on Saddam Hussein’s Iraq, caused immense suffering amongst the civilian population. At the height of the conflict the government – which many say had BCL involvement – trained and led soldiers to crush the Bougainville resistance; some researchers have since claimed that Australia provided support to the Papua New Guinea Defence Force in the process. Locals were victorious, but they paid a high price: the island has remained eerily stuck in time for a quarter of a century. In the nearest main town of Arawa, where I stayed, burned-out buildings and petrol stations still stand, and drunk youth loiter in parks. 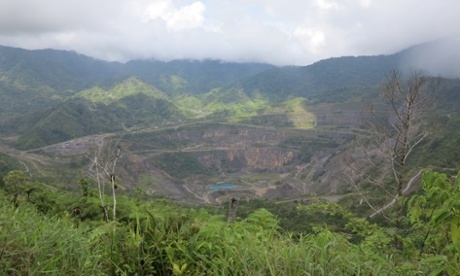 The region is nonetheless relatively safe these days, unlike many other areas of PNG, but it faces an even greater threat: the potential re-opening of the mine by the same forces who seem destined to, once again, not listen to landowners. During my time in Bougainville, I spent the vast bulk of my days with communities near the old mine and around the waste deposits that left vast swathes of land with little more than sandy dirt. A local woman, Theonila Roka, told me as the sun set on the polluted Kavarong river that mining simply isn’t necessary to bring Bougainville independence. “In many ways we’re already independent”, she said. “Most people are self-sufficient, growing their own food on their land.” She doesn’t ignore the economic realities of wanting independence through a planned referendum between 2015 and 2020, but she has no faith that BCL and the government won’t collude once more to deny mineral and financial rights to her people. Sadly, journalists rarely interview any Bougainvilleans. A recent report by the ABC run Australia Network completely ignored the locals and only featured an interview with the Australian-based writer of a study by the Australian Strategic Policy Institute (ASPI) that encourages more Australian engagement and big mining. As articulated by a notable dissenter of the ASPI study, locals are rarely given a voice. This year has also seen the unedifying sight of AusAid funding Australian academics such as Anthony Regan to assist the Bougainville Autonomous Government to draft new mining laws, which some claim is occurring without proper public consultation (something which Regandenies). During my time on the island, I constantly heard worries about the lack of transparency over who will be allowed to mine and how – along with who owns the rights to the resources. Nowhere in most media stories is any acknowledgement that Canberra is recruiting advisors with links to the mining giant – but Australia’s record as a colonial administrator to PNG is not easily forgotten on the ground. Some land-owners in Bougainville told me they resented outsiders telling them that they should suffer the reality of polluting extraction while Australians live comfortably in clean cities. The sheer scale of copper and gold beneath the ground explains the deals being struck. It’s easy to see why so many stakeholders are so keen to keep these issues out of the public spotlight: it’s a bad look to treat local concerns as illegitimate while waving around big dollars to seduce key players. Central Bougainville MP and minister for information and communication Jimmy Miringtoro told the Post Courier that the local population must become resource owners and shareholders. “These [mining] laws”, he said, “must also ensure equitable distribution of wealth from the mine so that no one group in Bougainville becomes rich while the rest are poor.” Indeed, deference to Bougainvilleans must be the priority – a position that remains anathema to diplomats, politicians and insider media. In the meantime, the lack of real democracy in Bougainville continues to haunt the island as its population gears up to make crucial decisions regarding its independence and the management of its resources. Former resistance leader Sam Kauona is one of the loudest public voices opposing the re-opening of the mine. He told me in Arawa that he recently met the BCL and Rio Tinto heads in the island’s capital, Buka. He said they were shocked when he said it was time for unjust mining legislation across Commonwealth nations to be changed to reflect the will of the people, and that Bougainville was going to lead the charge. On my last day, I met AusAid’s team leader in Bougainville, Deo Mwesigye. A friendly man who is curious about my reading of the political situation, Mwesigye believes the population largely supports the role of Australia in assisting the building of roads and hospitals there. But when I pointed out that these projects, while important, were referred to by many of the people I interviewed as little more than band-aid solutions, he remained silent. 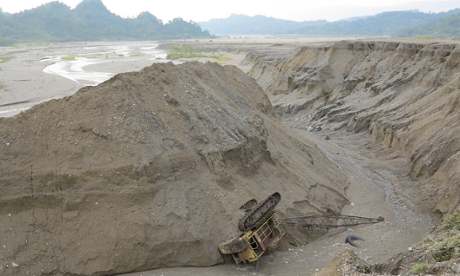 Today, locals or key land-owners remain skeptical of big scale mining, scarred by the past. Even though the local government initiated formal talks around Bougainville this year to discuss the possibility of re-opening Panguna, locals told me the meetings were not inclusive, that many land-owners felt they were excluded, and that authorities arrived with a pre-ordained goal: bring BCL back to the island. 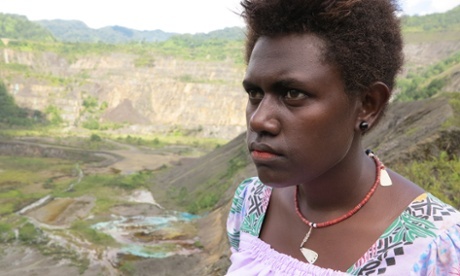 Women’s perspectives are almost invisible, though a Bougainville Women in Mining group submitted a paper recently which detailed their exclusion from the decision making process. PNG remains a unfinished nation which is being stripped of its resources, from logging to natural gas. The situation in Bougainville provides a perfect opportunity for authorities and the titans of multinational extraction to atone for the mistakes and crimes of the past.